Message Hero has been available to customers in Ireland for nearly a year now and we’re delighted to announce that we have now launched Message Hero for customers in the United Kingdom. 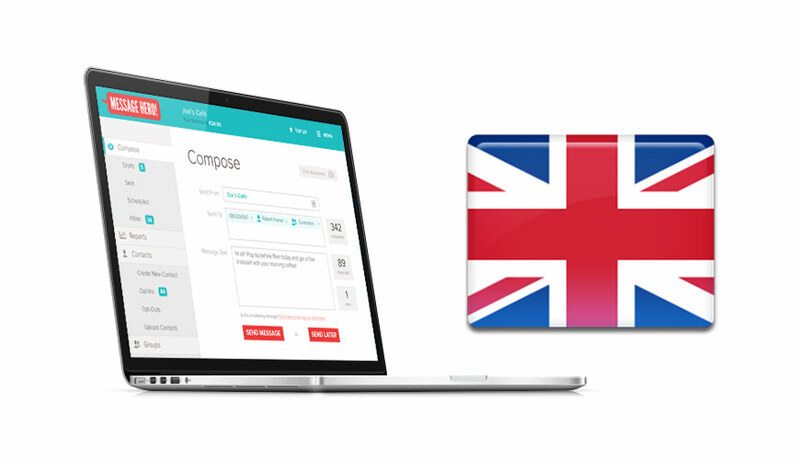 We have added a country selection dropdown menu to the signup form with a choice of Ireland and United Kingdom. Sending text messages with Message Hero in the UK is great value – just 3.3p per message! You can choose from one of four message bundles when you top up: 1,000 messages, 2,500 messages, 10,000 messages or 20,000 messages. Regardless of which bundle you choose, the cost per message will be the same, so you can just buy and use what you need – always at the best price! Each Message Hero account is free to set up, with no credit card required. Each account comes with 20 free texts to try it out, as well as a free keyword, which your customers can text to join your marketing list or send you texts which will appear in your online text message Inbox. So if you have customers or club members in the UK and you need an online tool for mobile marketing or text communications, why not try Message Hero free today?